How can mobile phone applications enrich people's lives, helping individuals or groups to live better? If you have a solution for a mobile application, and think you know how to make it work, you should enter the N2Y4 Mobile Innovation Challenge, sponsored by NetSquared. This is the fourth annual (Y4) NetSquared (N2) Challenge (hence N2Y4), and if you have not participated in one of them before, the entry process is unique. Starting today, participants can introduce their ideas for mobile applications to the members of NetSquared on their personal Web pages, assigned upon registration. Then your ideas are open to other members of the community to review; they can offer comments on your ideas until the deadline. By that date, April 3, 2009, participants must have finalized their submissions, taking the editorial comments and/or new information into consideration. So essentially, you have from now until April 2, 2009 to post your ideas and get feedback. Then, registered users of NetSquared vote on their favorite projects -- between April 6 and April 10, 2009. On April 13, 2009, the top 14 projects will be announced, and representatives from the 14 submissions will be invited to attend the N2Y4 Conference (with a travel stipend), where they each have the opportunity to explain their proposals in person. Three top prizes will be awarded when the finalists are announced. First place will receive $25,000; second place, $15,000, and third place, $10,000. NetSquared is headquartered in San Francisco, CA. It is a non-profit organization of TechSoup Global, that fosters social action projects through Web-based technologies. 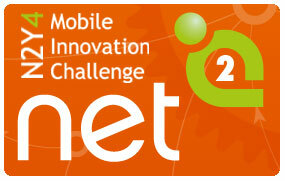 For specific information visit the N2Y4 Mobile Innovation Challenge, And take a look at the winning submission from the 2008 Challenge.